The ARCspectro-NIR (MIR) and ARCspectro-HT manufactured by ARCoptix are Fourier transform spectrometers (FTS). Although this type of device is used for the same scope as more conventional grating spectrometers - i.e. analyzing the spectrum of light - FTS operates in a different manner. This document describes their basic working principle in a concise and didactical manner. A FT spectrometer is an interferometer. 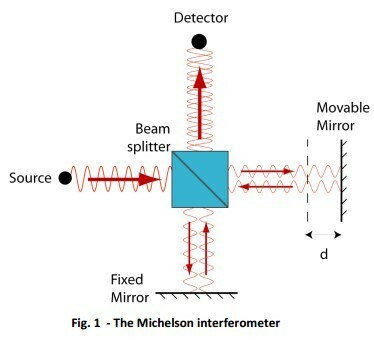 Its historical and most widely known configuration is the Michelson interferometer, shown on Fig. 1. A beam-splitter is used for dividing the light to be spectrally analyzed into two beams. After they have been reflected on two distinct mirrors, the two beams are recombined by the same beam-splitter and sent to a detector. One of the mirrors is fixed, while the other is a movable mirror. When the fixed and the movable mirrors are equidistant from the beam splitter (d=0) both beams travel the same distance before reaching the detector. However, if the movable mirror moved away, one of the light beams has to travel an additional distance δ = 2d (back and forth) called retardation, or optical path difference. produced: the intensity at the detector is zero. The intensity I(δ) measured as a function of the retardation δ is called the interferogram. It is important to understand that the period in the recorded interferogram depends on the light wavelength: the longer is the wavelength, the larger is the period in the interferogram. Let us consider a slightly more complicated situation where the light source emits at two discrete wavelengths, which is illustrated on Fig. 3. The left graph schematically illustrates the spectra of such a bi-chromatic light. 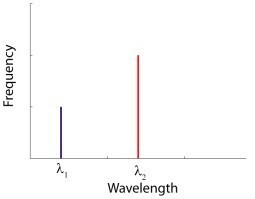 We have assumed that the shorter wavelength (blue) is less intense than the longer wavelength (red). interferogram that is effectively recorded by the photo-detector is simply the sum of the two other interferograms (lower black curve). In the example above, the two original wavelengths can still be distinguished quite clearly in the composed interferogram. However, in more complex circumstances, it is usually not so evident. A mathematical operation is needed for identifying the spectral intensity of the source starting from the measured interferogram - called Fourier transform - which will be discussed further. When the light source is characterized by a wide-band spectrum things are not so much different. For example, consider the spectrum shown in Fig.4. Each spectral component of the light source can be thought of producing an interferogram with its characteristic period, and whose amplitude is weighted by the relative spectral intensity. Again, the interferogram recorded by the detector is simply the sum of all these weighted monochromatic interferograms (red line). 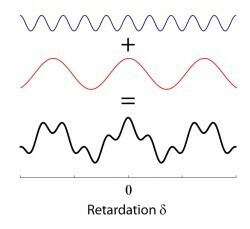 Note that all wavelengths are simultaneously interfering constructively at the zero retardation point (δ=0). This causes a strong intensity peak in the compound interferogram, commonly called centerburst, which is typical of interferograms recorded with wide-band spectra. At larger retardations, the modulation in the interferogram progressively dies-out. Indeed, the maxima of the monochromatic interferograms are progressively going out of phase, thus they are cancelling each other. where S(υ) is the spectrum of the light source expressed in wave-numbers υ=λ/𝜆 (the inverse of the wavelength, the so-called wave-number or spatial frequency). Do not bother too much on the fact that the spectrum is expressed in terms of wave-numbers instead of wavelengths. The only reason is that the integral, called (cosine) Fourier transform, has a slightly simpler mathematical form when expressed in wave-numbers. In conclusion, the essential idea to remember is that there is a 1-to-1 correspondence between spectra and interferogram. 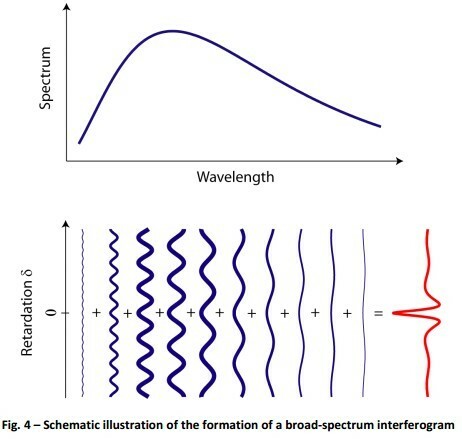 Each particular light spectrum is related to a unique interferogram, and each interferogram corresponds to a unique spectrum. The mathematical relationship between the two is the Fourier transform.